The Armstrong Association of Philadelphia's Employment Office, shown in a 1912 photograph from the association’s fourth annual report, helped skilled African American mechanics secure work. In addition to assisting adults with job placement, the Armstrong Association provided vocational training to children of working age to increase their odds of finding jobs after they left school. At times, the association faced resistance when placing migrants with employers. Some companies that agreed to provide jobs for migrants also requested that the organization only send African Americans with lighter complexions. 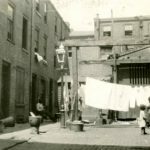 The Armstrong Association of Philadelphia conducted many investigations into the living conditions of African Americans in the city of Philadelphia as well as suburban areas of Pennsylvania and New Jersey. While assessing the needs of African Americans, the studies also gathered valuable information for migrants such as the availability of rentals and opportunities to purchase homes. 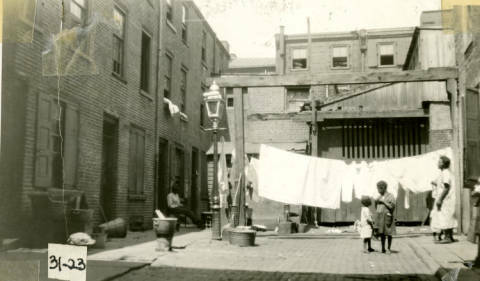 The organization found that African American families like the one in this photograph, from 1925 in Philadelphia, had a difficult time securing adequate and affordable housing. 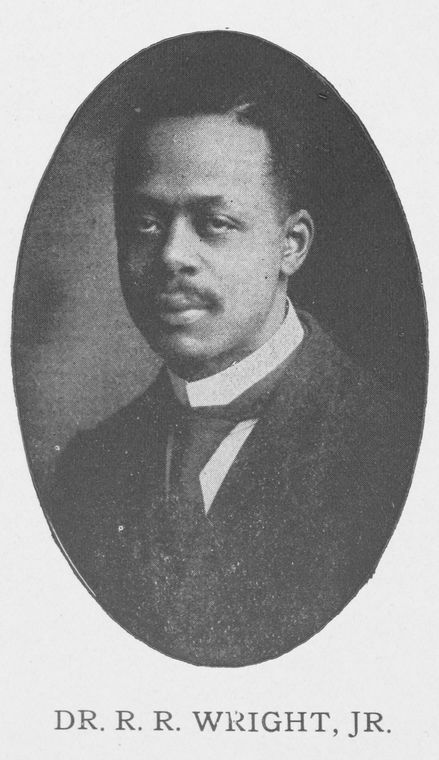 Born in 1878, Richard R. Wright Jr. became the first African American to earn a PhD from the University of Pennsylvania, where his dissertation research found that African American skilled workers in Philadelphia primarily worked in fields outside of their skill sets. 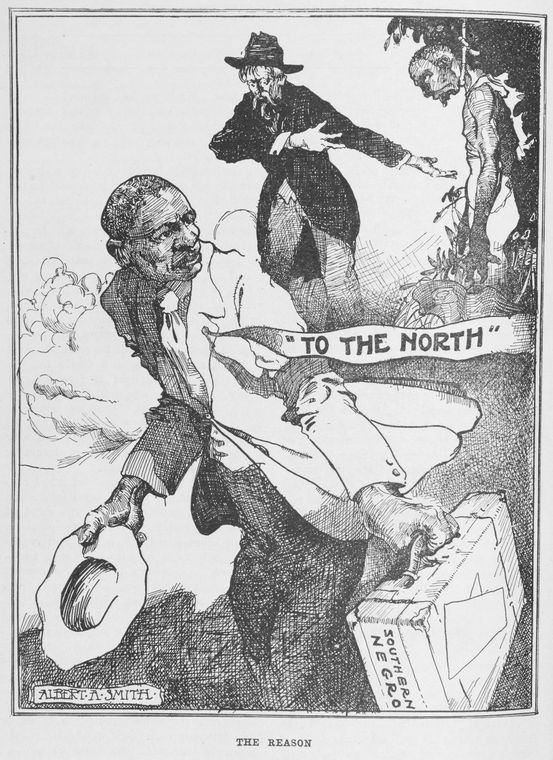 Wright urged John T. Emlen to add job placement to the Armstrong Association's agenda. After leaving the association, Wright became a professor and then President of Wilberforce University in Ohio. In addition to his work in education and continued activism, Wright also became editor of the Christian Recorder and became a bishop in the African Methodist Episcopal Church. 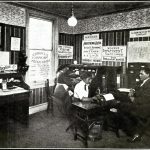 The Armstrong Association of Philadelphia was a social-service organization established early in the twentieth century to assess and address the needs of the African American community. Through its efforts to improve education, housing, and health, the organization addressed social and economic issues facing African Americans. Founded in 1908, the association formed as a branch of the New York-based organization named for Civil War General Samuel C. Armstrong (1839-93), who led the 8th United States Colored Troops. After the war, in 1868, Armstrong founded the Hampton Institute in Virginia as an industrial school for students of color and to produce African American teachers. The Armstrong Association raised funds for the Hampton Institute and for Tuskegee University in Alabama, founded in 1881 by one of Hampton Institute’s most famous graduates, Booker T. Washington (1856-1915). Philadelphia’s Armstrong Association began after Hampton educator John Thompson Emlen (1878-1955), who was part of the organization in New York, came to Philadelphia intent on bettering the conditions for African Americans. He believed that a branch of the Armstrong Association could supplement existing social institutions to address the needs of a steadily growing population of African Americans migrating from the South (a trend later termed the Great Migration). After a meeting between Emlen and Richard R. Wright Jr. (1878-1967), a doctoral student at the University of Pennsylvania, the Philadelphia branch began its work. Originally, the Armstrong Association consisted primarily of wealthy white philanthropists, but Emlen believed that an interracial board was key to the organization’s success. Each position on the board had two appointees: a white person as well as an African American. Emlen served as the organization’s secretary, and Wright acted as field secretary. Joining forces with the Philadelphia Housing Association and the Traveler’s Aid Society, the Armstrong Association studied living conditions and overcrowding during the Great Migration as African Americans flocked to northern cities seeking economic opportunities and better social conditions. In 1900, the African American population of Philadelphia was 63,000. By 1910, it had grown to 84,459 and within another ten years it surpassed 134,000. In addition to a housing shortage, new arrivals found it difficult to find employment, especially in their previous fields. Wright, who earned his doctorate in sociology, noted in his dissertation that many African American migrants to Philadelphia were skilled laborers, but they often faced discrimination from employers and had to take jobs outside their skill sets. 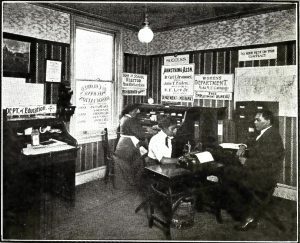 In response, the Armstrong Association developed initiatives such as an annual job fair, reports to monitor working conditions of African Americans, and representation in cases of workplace disputes. Using the Thomas Durham Public School at Sixteenth and Lombard Streets as a case study, the organization created a learning and social center to help African Americans with job placement and skill assessments. The school, named for a former administrator in the Philadelphia School District, was established in 1910 and served a predominantly African American student body. In a study, the Armstrong Association found that only 53 of the 163 students of working age were able to secure work. Those who did found occupations that required very little skill and no room for advancement and provided a poor living wage. The Armstrong Association determined that providing students with better vocational training would prepare them to enter the workforce. The association also provided job placement services for African American migrants, documented by oral history interviews conducted in the 1980s by historian Charles Hardy. 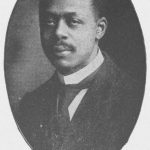 The association’s industrial secretary, Alexander L. Manly (1866-1944), who joined the organization in 1913, secured more than $35,000 in contracts for African Americans within his first eight months in the position. Despite racial discrimination, the organization succeeded in aiding many newcomers searching for employment. Emlen spent the remainder of his career in public service with the organization, while Wright left the group in 1909 because he favored self-help over the Armstrong Association’s emphasis on philanthropy. Wright later became a bishop in the African Methodist Episcopal Church. The Armstrong Association of Philadelphia went on to affiliate with the National Urban League in a merger that created the Urban League of Philadelphia in 1957. Through its work, the Armstrong Association of Philadelphia helped a generation of African Americans who migrated from the South find housing and employment in their new city. Sharece Blakney is a graduate student in American History at Rutgers-Camden. Gregg, Robert. Sparks From the Anvil of Oppression: Philadelphia’s African Methodists and Southern Migrants, 1890-1940. Philadelphia: Temple University Press, 1993. Hardy, Charles. “Race and Opportunity: Black Philadelphia During the Era of the Great Migration, 1916-1930.” Ph.D. diss., Temple University, 1989. Trotter, Joe William and Eric Ledell Smith. 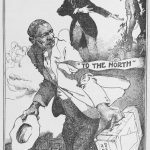 African Americans in Pennsylvania: Shifting Historical Perspectives. University Park, PA: Pennsylvania State University Press, 1997. Urban League of Philadelphia Records, Special Collections Research Center, Temple University Libraries, 1210 Polett Walk, Philadelphia. Armstrong Association of Philadelphia Annual Reports, Historical Society of Pennsylvania, 1300 Locust Street, Philadelphia. Oral History interviews by Charles Hardy, Goin North. Thomas Durham Public School, 1600 Lombard Street, Philadelphia.